TAG INTERNATIONAL TENNIS ACADEMY was founded in Singapore in 2001 by Tan Xu Teng, or affectionately known by his coaches and students as Coach X, with the vision of establishing a professional tennis club management and tennis coaching company based on holistic teaching approaches to provide players of all skill levels with the highest quality tennis lessons in Singapore. On it’s 15th Anniversay in 2015, TAG International Tennis Academy reached a milestone in its history by opening Singapore’s first ever indoor tennis courts named Winchester Tennis Arena. Nestled in the tranquil surroundings on Alexandra Park at 12A Winchester Road Singapore 117786, Winchester Tennis Arena is the proud home of TAG International Tennis Academy with four beautiful fully sheltered indoor tennis courts. With a generous roof of 40ft and a 15ft baseline, it is suitable for high level training and competitive tennis matches. 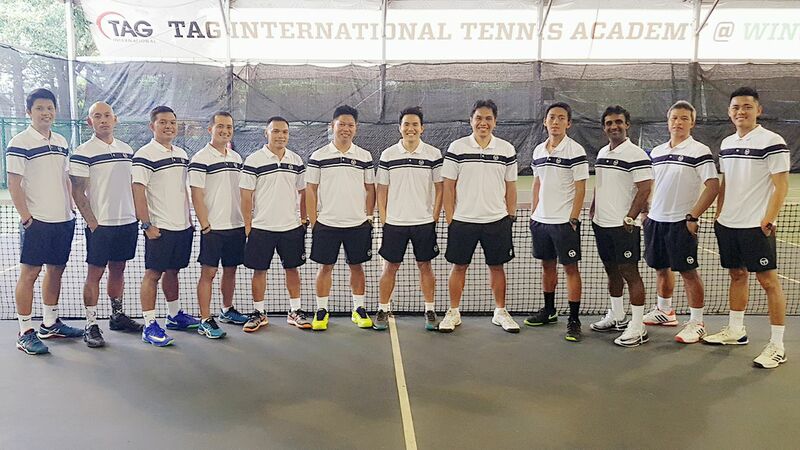 With its deep experience in club management, TAG International Tennis Academy has helmed the tennis programs for several prestigious town and country clubs in Singapore, delivering high quality and structured tennis programs to their members. Clubs that TAG International Tennis Academy have managed or are continuing to manage include The Tanglin Club, Chinese Swimming Club, Serangoon Gardens Country Club, Warren Golf & Country Club, Safra Mount Faber, Safra Tampines, Safra Jurong, Safra Yishun, Home Team NS Balestier, Home Team NS Bukit Batok, Changi Beach Club, Ferraria Park, and Lake Life. Clubs that are interested in professionally managed tennis programs are welcomed to contact us to explore such possibilities. Doubles Mastery by TAG International Tennis Academy is a course developed by the collective efforts of TAG International’s team of elite coaches. Doubles Mastery also focuses on teaching you how to be a better doubles player individually, so that you can partner anyone in your social tennis or club league. The emphasis on when to poach, when to pinch towards the middle, when to steal a point, how to bait an opponent into giving you a ball you want, and the specific footwork patterns required to execute these shots are emphasised. Perfect for regular partners or ladies teams that participate in the WITS and LTS tournaments in Singapore. Sign up now and learn how to play the best doubles in your life, and be loved by your club mates, teammates and social groups. … Immerse in the TAG International Tennis Academy Experience Now.